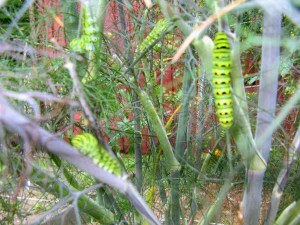 Some time ago I noticed that my fennel bush was crawling with caterpillars. They had distinctive green, yellow, and black stripes in a dot and dash formation somewhat like Morse code. Despite the fact that they were devouring my fennel fronds with glutonous ferocity, I found them quite pretty. When I took one down to Ward’s Nursery in Great Barrington and mentioned that I’d found it on the fennel, it was identified as the caterpillar of the Eastern Black Swallowtail butterfly which feeds off anything in the carrot family — parsley, dill, Queen Anne’s Lace, fennel, and anise. 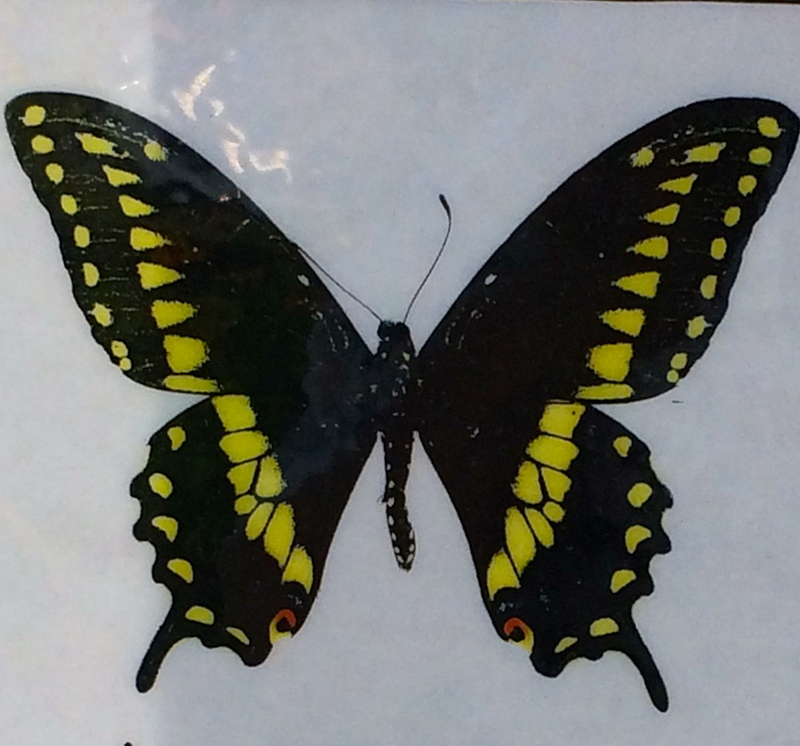 In fact, its western counterpart is called the Anise Swallowtail because — well — I think I’ve established its eating preferences. 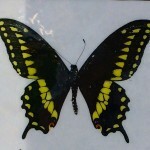 When I looked up Eastern Black Swallowtails in my Audubon Butterfly Guide, I discovered that they’re very common and smaller than most North American Swallowtails (the wingspan is only 3 inches across), but that doesn’t make them any less beautiful. Their wings are the black and blue of old stained glass windows with bright touches of yellow and orange dappling the outer edges. The female and male display subtle differences: the wings of the female have more blue, the males’ wings are spotted with two rows of yellow. Then, practically overnight, the caterpillars were gone from my garden, leaving my fennel plant stripped but still upright. The fronds began to grow back. But I missed watching the caterpillars feed. I missed this small but immediate reminder that nature is constantly performing an intricate balancing act. I’m not sure where they went to in the interim, but I recently noticed dozens of black wings in my sun garden, fluttering over the echinacea and competing with the hummingbirds for a turn at the monarda. There they were! 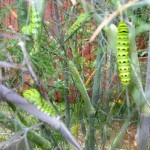 The Eastern Black Swallowtail caterpillars had made the trip from vegetable bed to perennial border, transforming themselves into butterflies along the way. 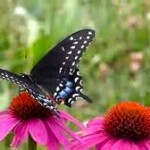 If you visit the new Butterfly House at Project Native in Housatonic, Mass. (http://projectnative.org), you’ll find out more about the critical symbiotic relationship between plants and butterflies. Who takes the pictures for your blog? Is it you? They are all just perfect. This is an especially welcome post. 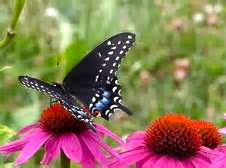 I love watching butterflies this time of year, and even though the monarchs are struggling, I see a lot of others including the red spotted purple that can be confused with the black swallowtail. I wonder if you are able to use the fennel in your cooking. Am looking for some inspiration…. Thanks, Patty. I use the fennel fronds in place of dill (though they have more of a anise flavor). I can’t seem to grow dill here — it flowers so quickly! Liza, I loved this post. This week I encountered the Sphinx Moth for the first time over at the horse barn. 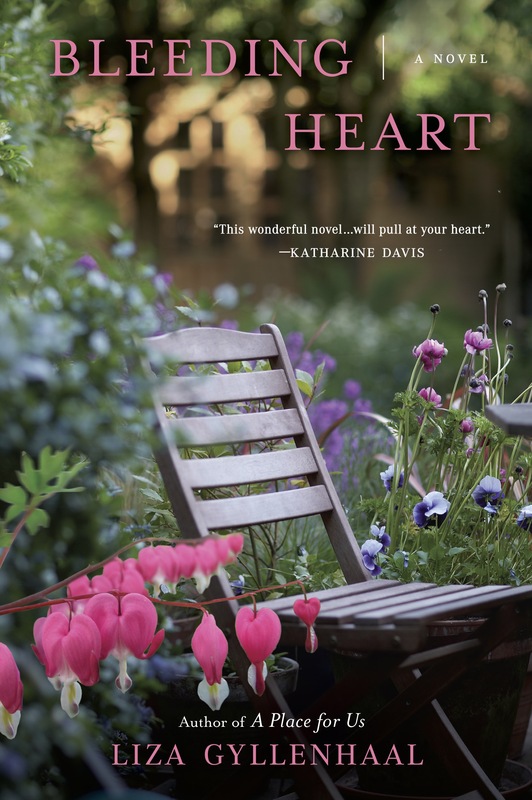 Do you ever see them in your garden? It’s as if nature was interested in coming at the idea of a hummingbird from the butterfly/moth angle as well as the bird angle. I have seen them, Nicie — scary looking dudes. I didn’t know their names until now. Sphinx Moth — what a perfect name for them. Thanks! …if you are interested and want to have hundreds of beautiful butterflies all around you..let me know: in October the butterfly collection at the Museum of Natural History will re-open and as a volunteer I have access to tickets you may want to use.. I volunteer on Thursdays from 12-2PM. Come and enjoy! I would love to do that, Annette! Thanks so much. Love this post and the poem. Thank you. It’s one of my favorite poems, Lorraine. The Kunitz poem is truly amazing, especially knowing that he wrote it in his late 70s and lived for 20-some more years! Yes — and some of his greatest poem, those collected in PASSING THROUGH, were written in the last two decades of his life. Give us a break! 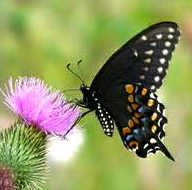 A wonderful poem and nice butterfly piece.